The seed tube is generous in height, making it impossible for squirrels to hang down from the top reach seed. The four feeding ports are easily accessible via the perch ring. The heavy metal cap fits snugly on the tube to prevent squirrels from lifting it to reach the seed. 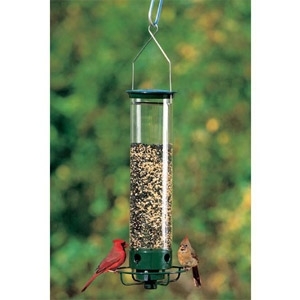 The clear feeder tube makes the seed visible to the birds, a proven advantage. Made of UV stabilized polycarbonate, it ensures long lasting durability without yellowing, its length and girth are designed to prevent squirrels from reaching the seed ports. With a large 5 lb. capacity, you don't need to refill your feeder every day. An internal baffle design keeps seed flowing freely to the ports. With the metal top and base powder coated in Forest Green, the Flipper looks great in any yard. Hang the Flipper securely from its heavy duty signature looped stainless steel wire which reduces motion.